Kash at Streetlightblog and Angry Bear explains easily with one graph both how the federal budget got to be in such imbalance (deficit) relative to GDP and how insignificant the so-called “massive stimulus” was in 2009-10. I think that when trying to understand the federal government’s fiscal situation, at least on the spending side, it is more informative to see how we got to where we are. We now have an on-budget (i.e. excluding the Social Security program, which continued to run a surplus in 2010) deficit of about 9% of GDP. In the early 2000s, the budget deficit was about 4-5% of GDP. That’s deterioration in the on-budget deficit of about 4-5% of GDP between 2003 and 2010. Defense spending has gone up about 2 percentage points since the early 2000s. Med+Med spending has gone up by about 2 percentage points since the early 2000s. 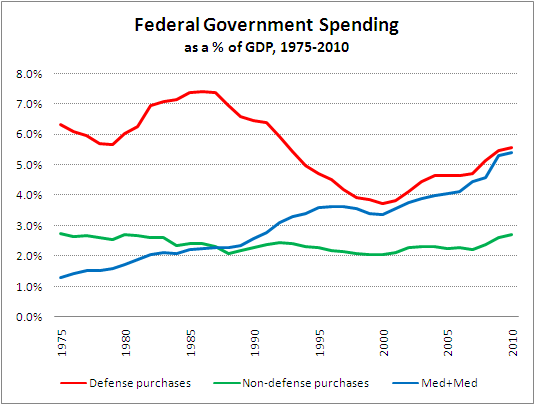 All other federal spending has meandered feebly between 2% and 3% of GDP. That slight lift in the green line in the last two years is the “massive” stimulus, or put another way, what “out of control government spending” apparently looks like. If it weren’t for increased defense spending and the Meds over the past several years, the federal government’s budget balance would have been pretty close to unchanged. Despite the most severe economic downturn in 70 years.